POET - the familiar name that Donald A. Norman gave his 1988 classic "The Psychology of Everyday Things" which I recently picked up in the library. It has since been updated a little and reissued as The Design of Everyday Things . But I like POET. There is, after all, great poetry to be found in the workings of even the simplest device. And when things are not so artfully conceived: great tragedy and boon for cranky geeks everywhere. How can one not enjoy, for example, subjecting alarm clocks that have identical "snooze" and "reset" buttons to exemplary castigation? Or lambasting the purveyor of inappropriate door handles: those that are designed to "pull", but require a label that says "push" because that is the way the door swings? Humans do not always behave clumsily. Humans do not always err. But they do when the things they use are badly conceived and designed. Nonetheless, we still see human error blamed for all that befalls society. Despite being published in 1988 and primarily drawing its examples from the world of simple electro-mechanical devices, the book's philosophy and advice is remarkably enduring. I do take issue with one example however. 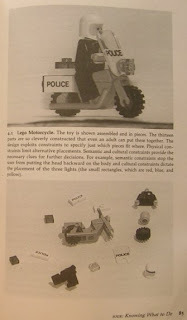 Norman presents the case of a Lego police motorcycle model as an example of excellent design. Why? The design cleverly exploits physical, semantic and cultural constraints so that there is basically only one construction solution. Which is great if the objective is to make construction quick, easy and repeatable with a high degree of quality. Great! Its teaching kids how to be highly productive assembly line workers. And that is where I think Lego started to go badly wrong. New Lego, personified by custom molded pieces and kits that could only make one design, may win design awards. But it does not serve it's purpose and it's users. The beauty and enjoyment in Classic Lego came from the very fact of its flexibility and lack of constraints. With a little squinting, it was possible to believe you could build anything. As Norman himself argues, there are situations where it is useful to pervert the design principles (such as with safety features). Classic Lego is a perfect study in the appropriate application of Norman's principles in reverse, whereas New Lego is just a great way to waste money. To mangle a famous quote..
Give a child a Lego Police Motorcycle Kit , and you have bought a few hours of peace. Give a child a Lego Basic Bulk Set , and they are set for a lifetime. I've had my head in Neal Stephenson's Cryptonomicon for the past few weeks. Seriously, at a thousand-over pages, its not one to knock over in an evening. But it is a fantastic tale. Actually more like three tales in one. It makes me wonder how he does it. The writing is like stream of consciousness, and I guess it would need to be judging how prolific he is (I haven't even started on the baroque cycle). Yet if mere mortals like you or I would try this, I am pretty sure the result would be pure tripe. I am dazzled and intrigued by the miscellaneous tangential twists and turns of the narrative, and the incredibly inventive detail that scatter the way, like breadcrumbs leading to a safe haven. Little things such as his similes. Now isn't that brilliant? Surely deserves a named place in the CSS Color Palette if I were the judge! And subtle digs that flit by if you are not paying attention. "You know what that is? It's one of those men-are-from-venus, women-are-from-mars things"
"I have not heard this phrase but I understand immediately what you are saying." "It's one of those American books where once you've heard the title you don't even need to read it," Randy says. After enjoying Quarter Share so much, I quickly listened to the sequels Half Share and Full Share. 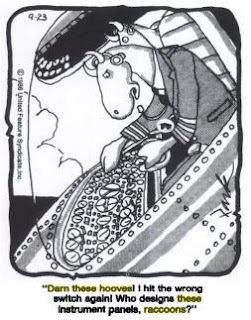 They continue Ishmael Wang's career aboard the Space Clipper Lois McKendrick in rollicking fashion. Honest to goodness ripping yarns! I was sad to complete the trilogy, buoyed only by the hope that the author, Nathan Lowell, would continue the series. So of course I checked out Nathan's site - The Trader’s Diary - to discover Nathan has already completed another in the Golden Age series: South Coast. And its already #3 in the Podiobooks Top Overall Ratings chart. ...my iTunes is running hot now!